What would be your first thought if you enter a car wash and the walls are brown, the windows are filthy, the red brushes are black, and there is a buildup of gray scum on the car wash covers? Chances are you may already have visited such a wash (I actually saw a corn stalk growing in one wash). Hopefully, this does not describe your own wash! Do you ever wonder how people trying to sell houses or cars can post pictures that show them messy and dirty? What does that do to the pool of prospective buyers? Your car wash is the same thing. You are selling your wash to customers. Your customers are going to judge the cleanliness of your wash and translate that to how well you take care of your wash equipment. If filthy, customers will think twice about taking their vehicle through your wash, and if they do, they most likely won’t return. Keeping a clean wash bay isn’t an easy task. Does your car wash use reclaimed water? How hard is the fresh water? Are the entrance and exit doors closed most of the time to keep debris such as leaves from blowing inside the bay? Is your wash located in an area where a higher percentage of cars and trucks come in caked with mud and sand? What types of car wash chemicals are being used? All these factors will decide how often a wash bay will need to be cleaned to keep it presentable. What type of products can be used to keep the walls, windows, brushes, and equipment clean? An acid based wall cleaner is usually the answer. Keep in mind that not all wall cleaning products are created equally. The safety data sheet of one wall cleaner says “Danger: Causes severe skin burns and eye damage. Harmful if swallowed. Toxic if inhaled. May cause cancer by inhalation”. It also says “Immediately call a POISON CENTER or doctor” if there is ANY skin contact. I don’t believe the average person would feel that safe using such a product unless they dress up in a hazmat suit! 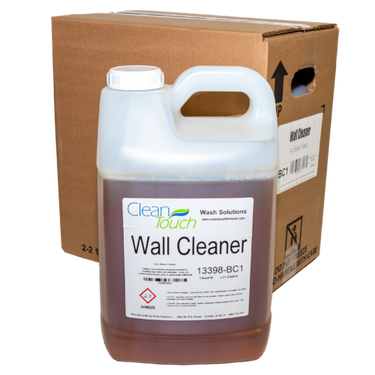 CleanTouch Wall Cleaner is very easy to use. If it’s been a while since the wash bay has been cleaned, start out at full strength. It can be diluted up to 4:1 if using it as a maintenance cleaning. Pour it into a hand-pump sprayer and apply by starting at the wall section closest to the ceiling. Apply to a section that is no wider than 10 feet wide. Allow the solution to dwell for a minimum of one minute and rinse. A high pressure wand is recommended. If CleanTouch Wall Cleaner does not foam up when applied to the wash bay surfaces, no dried-on water scale is present. If the wash bay surfaces still remain dirty after all the water scale has been removed, CleanTouch Extreme Clean should be used. Apply using the same method as CleanTouch Wall Cleaner (Caution: Do not apply Extreme Clean to aluminum surfaces). The most effective method for cleaning brushes is to apply Wall Cleaner first, rinse, apply Extreme Clean, and rinse. Start using CleanTouch Wall Cleaner and transform your wash bay into looking new again!